This is a demo of the mojoPortal WebStore feature. Currently the WebStore is able to sell download products but still lacks a lot of needed features such as shipping calculations, so it is not currently a full blown general purpose ecommerce solution. It is used to sell add-on products for mojoPortal through the mojoPortal Store, which has been running since mid 2008. Over time we do expect to evolve this feature into a more comprehensive ecommerce solution. Note that here on the demo site a fake credit card will be pre-populated so you can test the checkout process. The mp3 files on this demo are original music by Joe Audette (founder of the mojoPortal project) and The Reality Salad Band. The songs were recorded in the early to mid 1990s while Joe was the lead singer and played rhythm guitar in the band. 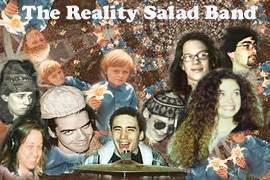 The Reality Salad Band played in the Nashville area from 1991 to 1995.